White Star, +James Spahn's sci-fi adaptation of Sword & Wizardry's White Books rules have been a resounding success and is probably the hit of the year. So no surprise that in exactly 1 week from its release we see the first 3rd party adventure being released on OBS. 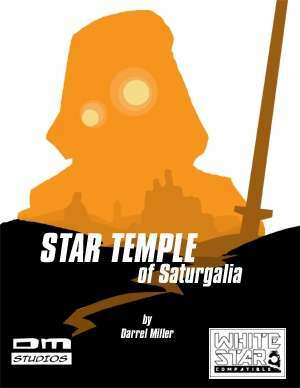 The Star Temple of Saturgalia by Darrel Miller of DM Studios is a small 6 page adventure for low-level heroes and is very much the traditional dungeon crawl style adventure with some mild outer space/world travel and random encounters. An adventure crafted for OSR games, and is compatible with Sword and Wizardry and White Star. The adventure is rather straight forward and to the point. The players are sent to retrieve a relic of the lost Star Knight age. On their way they may run a foul any number of the various dangers that present themselves in the world and in the end may hinder a threat to both the Star Knights and The Way. At six pages the adventure may occupy a single night of play and with its low-level attention can be used as a way of jumping into a longer campaign I wish the desert planet had been a little more fleshed out and perhaps a little more to the temple at the adventures end ... but all in all a nice little romp into a Galaxy Far, Far Away. The Star Temple of Saturgalia can be picked up at any of the OBS sites for $1.00.